The 2015 Cadillac Escalade marks the start of this luxury SUV’s fourth generation and remains the largest and most expensive model in the brand’s lineup. As always, the Escalade rests on the platform that underpins GM’s pickup trucks and other large SUVs, and is sold in rear- and four-wheel drive configurations. Standard and stretched (ESV) wheelbase versions are available, the latter adding 14 inches to the wheelbase and nearly two feet overall. 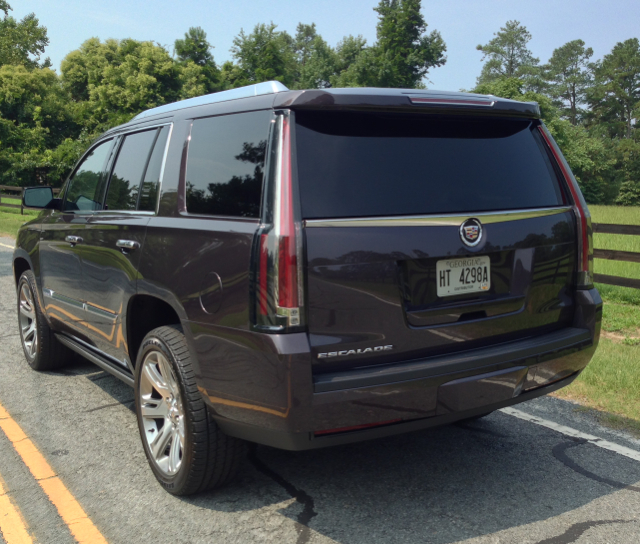 My test vehicle was an Escalade Premium 4WD with a base price of $82,795. This model is also sold in Standard ($71,695) and Luxury ($75,695) editions. An all-new Platinum ($90,270) edition will be introduced this fall. As equipped, my weekly driver came with a few options including: power retractable assist steps ($1,695), 22-inch, 7-spoke aluminum wheels ($500) and majestic plum metallic paint ($495). With options and destination charge, this model cost $86,480. Add upwards of $3,000 for a stretched version. For 2015, you get one engine and transmission combination: a 6.2-liter V-8 engine making 420 horsepower and 460 foot-pounds of torque and paired with a six-speed automatic transmission (an eight-speed automatic will arrive later in the model year). The engine is a third generation EcoTec3, what comes with direct injection, variable valve timing and Active Fuel Management (AFM). AFM is technology that shuts down half the cylinders at highway cruising speed in a bid to save gasoline. This model is EPA-rated at 14 mpg in the city and 21 mpg on the highway. It takes regular grade gasoline — I averaged 16.4 mpg for the week. The Cadillac Escalade has always been massive in its proportions and the current iteration upholds that theme. The new design complements Cadillac’s current design language, the latest version of its art & science look. Flanking the oversized grille is full LED lighting, including stacked daytime running lights. To the rear, massive LED tail lamps span from the top of the roof to the bumper for a design that is (literally) punctuated by a pair of exclamation points. The slab profile of the Escalade is a familiar look and is enhanced with chrome touches, but you will not find as much “bling” as on some of the previous models. With a key fob present, the door handles light up and any door will open when pressing the proximity button located on the respective handle. The optional retractable side steps are familiar to Escalade fans and come in handy for ease of access and egress. 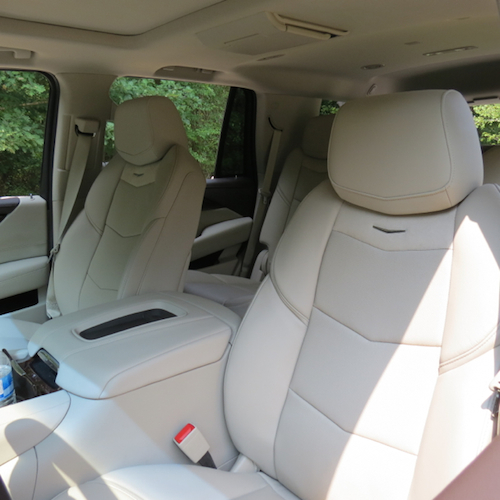 Inside, the Cadillac Escalade is cavernous, bright and outfitted with generous amounts of leather. Cut and sewn leather is on the seats and is also found across the dashboard, wrapping the steering wheel and on the doors. Wood accents are on the doors, across the lower dashboard and cover the front center console. Aluminum door handles and accents complete the refined look. Standard seating is for seven with bucket seats up front, captain’s chairs in the second row and a power flip 60-40 split bench seat for three in the third row. The second row seats fold down and flip forward, making access to the third row a snap. Individual power buttons drop each seat and flip them forward. You can also opt for a middle bench seat to gain an eighth seating position. The driver’s seat offered no surprises: it is as comfortable and supportive as you would expect. Cadillac puts the emphasis on “cushy” and that’s the way that you will feel as you glide your way down the highway. The Escalade was the second Cadillac model that I have tested that also came outfitted with a LCD instrument gauge display. When the vehicle is off, you see a blank screen. When it is on, a 12.3-inch configurable display with 3D images provides the usual vehicle data you want: speedometer, tachometer, fuel information and more. You can also adjust it to place navigation information or entertainment information front and center, changes that can be made by way of the steering wheel mounted controls. I may be a traditional two- or three-analog driver, but this Cadillac panel is beautiful. The head-up display is another welcome feature. 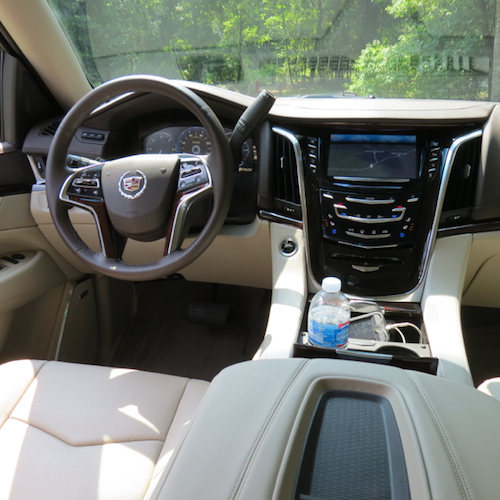 As with the earlier Cadillac XTS, the Escalade come outfitted with CUE — Cadillac User Experience — an infotainment system with its own bright, colorful display located at the top of the center stack. The system “knows” when you want to do something: the very moment it senses your hand in front of the screen, a menu panel emerges at the top and bottom of the screen. Control the audio, your connected phone, set up navigation and adjust the climate control with each app. Other apps allow you to access Pandora, pull up weather reports, control the Blu-Ray DVD system or contact OnStar, the latter giving you live support for directions and a host of other services. Cue is one of the easiest systems to use. However, the voice commands failed more often than they were understood — one area in need of improvement. The center console features sliding and folding compartments for holding your smartphone and two drinks. Another smartphone compartment is located on top of the covered storage compartment, what holds a pair of headphones and is large enough to house your purse. A “secret” storage panel is located directly behind the audio and climate controls. I had no idea that is was there until I accidentally pressed a button and the door flipped up. The compartment has a USB port and is also large enough to hold your wallet. All four doors come with two drink holders apiece along with other storage trays. Three additional drink holders are found in the third row — two on the left side and one on the right side of the vehicle. The 2015 Cadillac Escalade Premium comes with more standard equipment than can possibly be mentioned or at least given the justice necessary to describe the benefit of each one. A tilt and slide moonroof, the drop down Blu-Ray video screen, ventilated front seats, heated front and second row seats, second row climate controls, a 110-volt outlet and a 16-speaker Bose audio system were included. Not available with the test model, but rolling out during the model year is a OnStar 4G LTE system with available Wi-Fi hotspot. 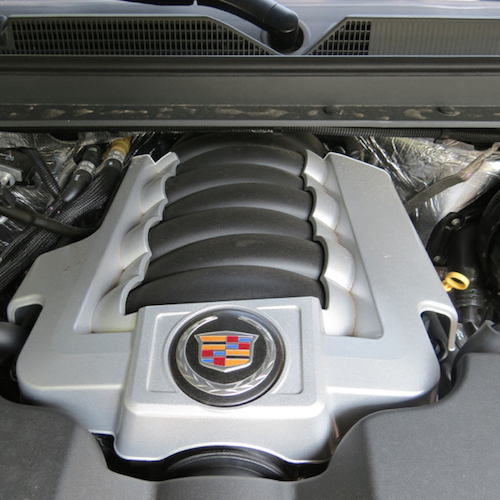 The Escalade’s big V-8 engine is up to the task. It moves this nearly three-ton road yacht from 0 to 60 mph in just under six seconds. The engine is quiet — or at least the sound deadening materials effectively muffle the noise — and the transmission shifts smoothly up and down through each gear. Electric power steering helps this SUV take each turn with ease. 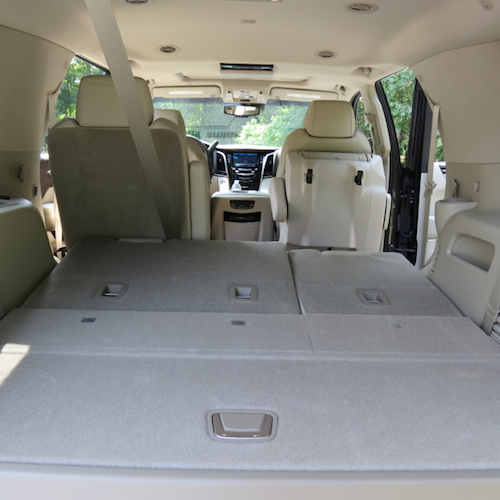 It is a no-drama system that makes it easy to handle the Escalade. Four-wheel disc brakes bring this SUV to a smooth stop. For 2015, Cadillac made some changes in the safety department. A front center airbag is new, the first time one has been included in this segment. This model also comes with a safety alert seat, forward collision alert and lane departure warning. Also available across the Escalade line — standard with the test vehicle — is a driver assist package that brings in adaptive cruise control, automatic collision preparation, front and rear automatic braking and automatic seat belt tightening. Pop open the lift-gate and you have a generous amount of storage room along with a concealed storage compartment. The spare tire resides underneath the vehicle. On the right side of the compartment are four switches that control the second and third row seats. If desired, you can have everything folded flat inside of 10 seconds. The Cadillac Escalade sells itself — you either like this type of vehicle or you do not. In the past, a sedan would have served as this marque’s flagship vehicle, but that honor now resides with the Escalade. This model still has its fans and the 2015 edition will meet their expectations with several current and pending improvements offering further enticements. EDITOR’S NOTE — While this vehicle was being tested by Auto Trends, we received a notice by Cadillac for the new Platinum edition or collection. Cadillac also announced that all Escalade models built from the fourth quarter 2014 on would receive technology upgrades that would add $1,275 to the base sticker price. Those upgrades will include a standard eight-speed automatic transmission, a Surround View camera system and OnStar with 4G LTE connectivity and WiFi hotspot capability. Those changes were announced here. 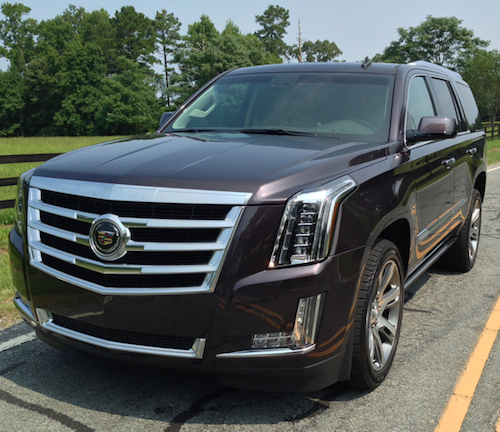 2015 Cadillac Escalade Premium 4WD photos copyright Auto Trends Magazine. All rights reserved.